Having an arsenal of quick-to-assemble sauces made out of pantry staples can absolutely save you on those nights when you forgot to plan ahead. Simple sauces are the key to transforming refrigerator leftovers or freezer finds into a legit meal. So I’m going to be sharing more sauce recipes on their own to give you the tools to mix and match your way to your own quick weeknight dinners. 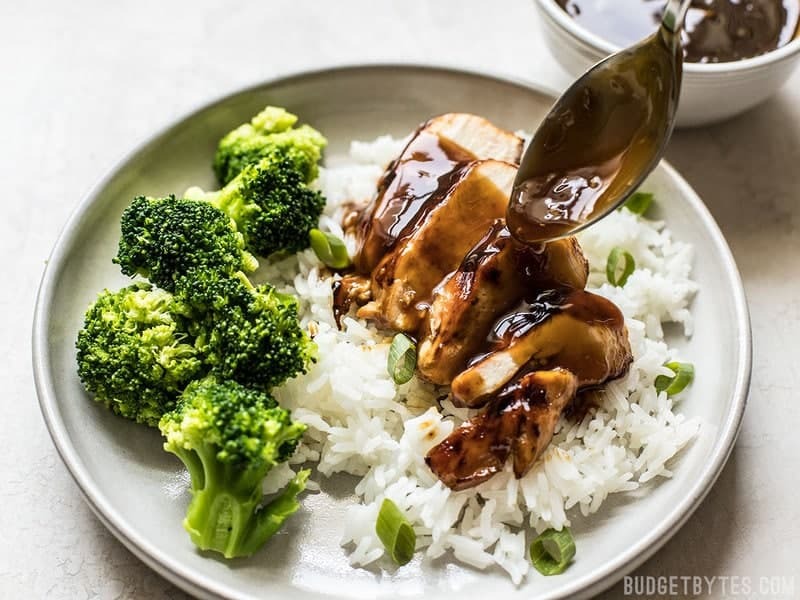 This Easy Homemade Teriyaki Sauce (or marinade) is probably my most used sauce because it’s so versatile and uses only a few ingredients that I always have on hand. As a Marinade: Flavor your chicken breast or thighs, pork chops or tenderloins, tofu cubes, or even fish (it’s great with salmon!). Marinate chicken, pork, or tofu for at least 30 minutes, and marinate fish for only 15 minutes. Then toss your meat, fish, or tofu on to the grill, cook in a skillet, bake, or even transfer everything (meat and marinade) to a slow cooker. As a Sauce: The thickened sauce can be brushed onto grilled or baked meat, or tofu. Or, use it as a stir fry sauce by pouring the not-thickened sauce directly into your hot stir fry pant. The extreme heat of the pan will instantly simmer and thicken the sauce as it coats your stir fry vegetables or meat. *Do not use used marinade to make the sauce. Instead, make two separate batches to avoid cross contamination. The quantities listed below make about 1/2 cup marinade or 1 cup of thickened sauce. 1/2 cup marinade is about enough for 2 chicken breasts, 4 boneless chicken thighs, one 14oz. block of tofu, or about four pork chops. As a sauce, one cup would be enough for about one four serving portion of stir fry, or to brush onto about four chicken breasts. You can easily scale the recipe below up or down by changing the number in the “servings” box and the rest of the ingredients will adjust automatically. 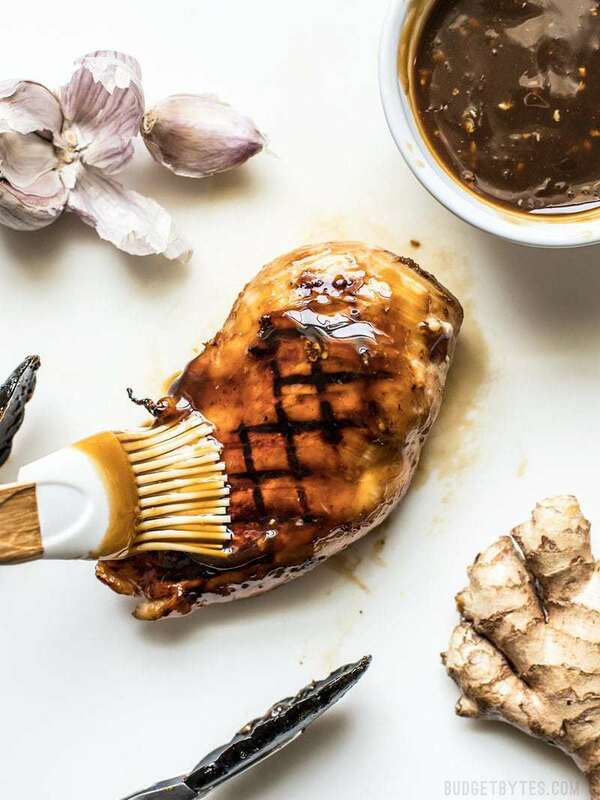 This Easy Homemade Teriyaki Sauce (or marinade) takes only a few minutes and five simple ingredients that can be kept on hand at all times. Perfect for last minute weeknight dinners! 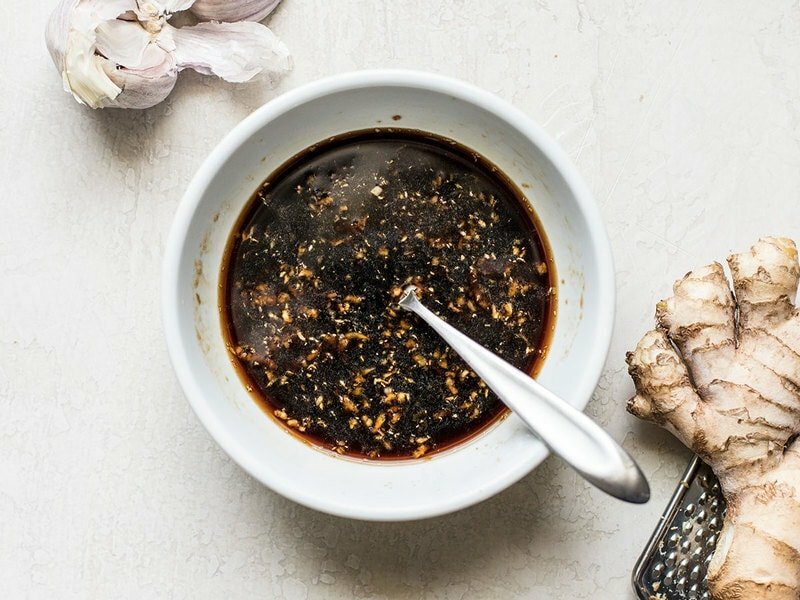 To make the marinade, stir together the soy sauce, brown sugar, minced garlic, grated ginger, and water. 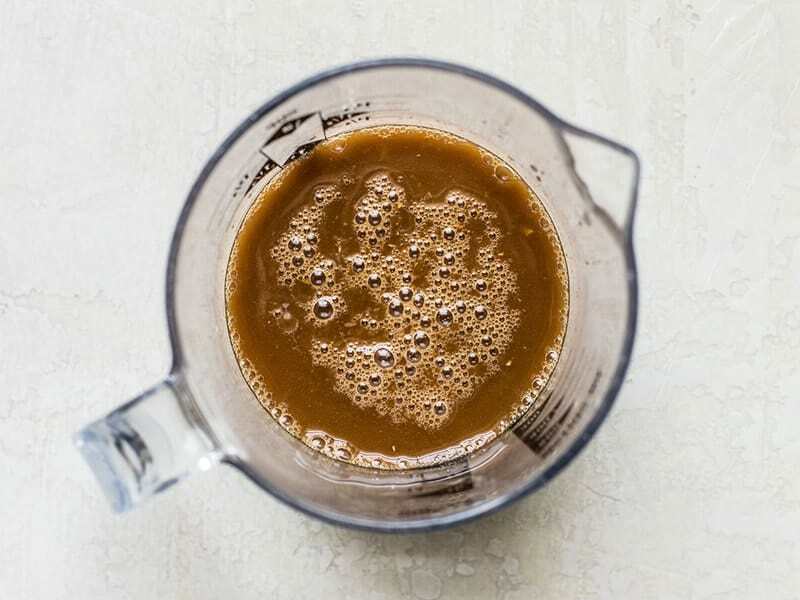 Pour this mixture over your meat, tofu, or fish and marinate for 15-30 minutes, depending on the item. 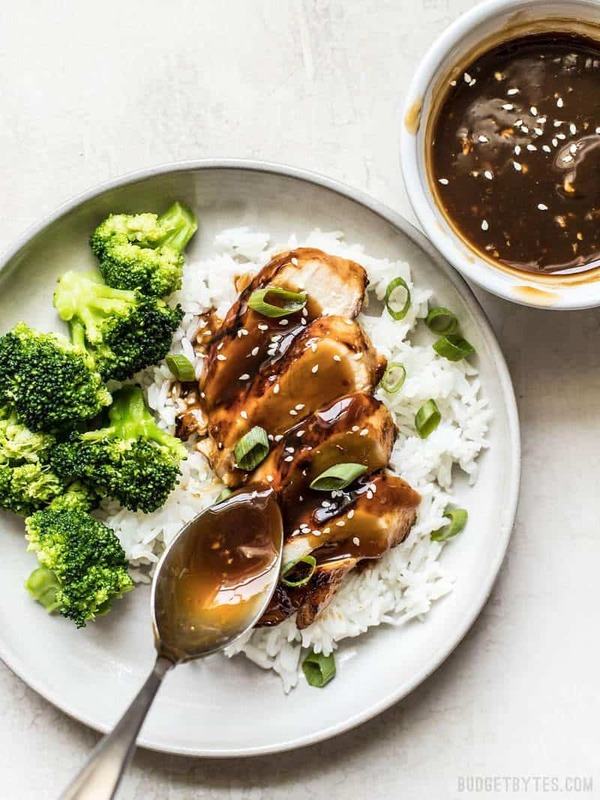 To make the sauce, stir together the soy sauce, brown sugar, minced garlic, grated ginger, water, AND add an additional 1/2 cup water and 1 Tbsp cornstarch. (Do not turn used marinade into a sauce. Rather, make separate batches to prevent cross contamination.) Bring this mixture up to a simmer in a small sauce pot over medium heat, while whisking. Once it reaches a simmer, it will thicken into a shiny sauce. Pour or brush the sauce over your cooked meat, vegetables, or tofu. 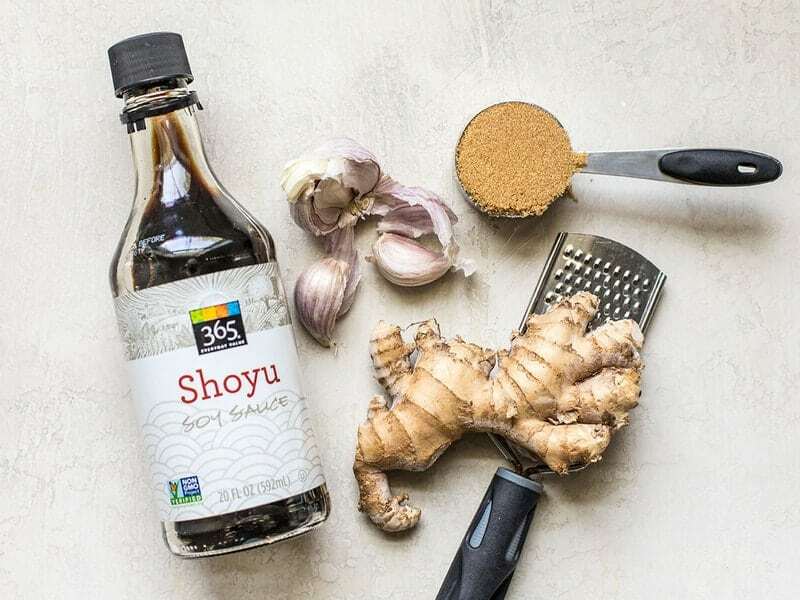 To use as a stir fry sauce, stir together all of the ingredients in a bowl. Once your stir fry meat or vegetables are cooked, pour the sauce mixture directly into your hot stir fry pan instead of simmering separately in a sauce pot. The heat from the pan will simmer the sauce on contact and thicken the sauce (make sure the stir fry pan is very hot). Stir to coat your cooked vegetables or meat. It all starts with these four ingredients, which can be kept on hand at all times. I keep my fresh ginger in the freezer (in a quart-sized freezer bag), so I can take it out and grate a little bit as needed at any time. It is much easier to grate when frozen. 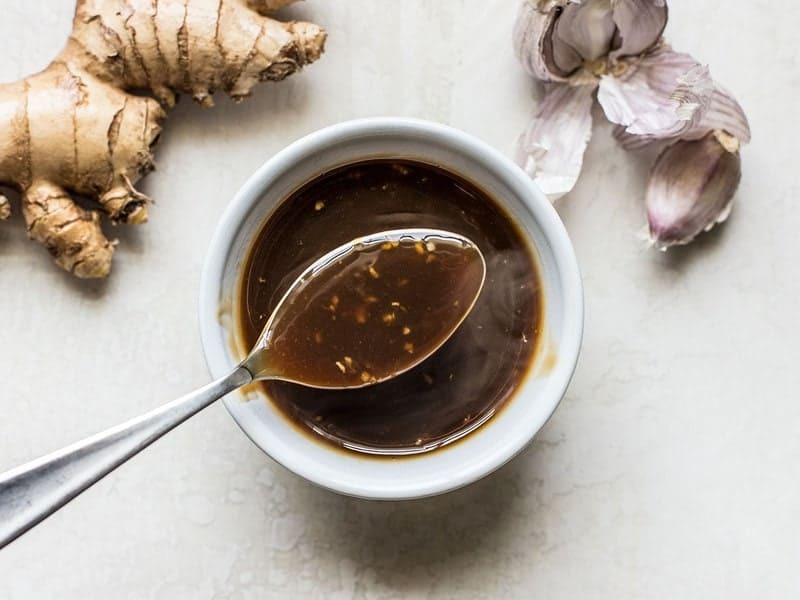 To make the marinade, simply stir together 1/4 cup soy sauce, 3 Tbsp brown sugar, 1 Tbsp water, 1 clove of garlic (minced), and about 1 tsp grated ginger. That’s it. That only takes about 5 minutes. This mixture is very concentrated in flavor, so it will flavor whatever you soak in it deeply. Meat or tofu can marinate for about 30 minutes, fish for 15 minutes. Then just cook your meat, seafood, or tofu using your favorite method. Add the mixture to a sauce pot and bring to a simmer over medium heat, while stirring. Once it simmers, it will go from milky to clear and watery to thick. Your sauce is now ready to pour over your cooked meat, vegetables, or tofu. OR, if you want to use it as a stir fry sauce, you can just pour the un-thickened sauce directly into your hot stir fry pan and it will simmer and thicken on contact. 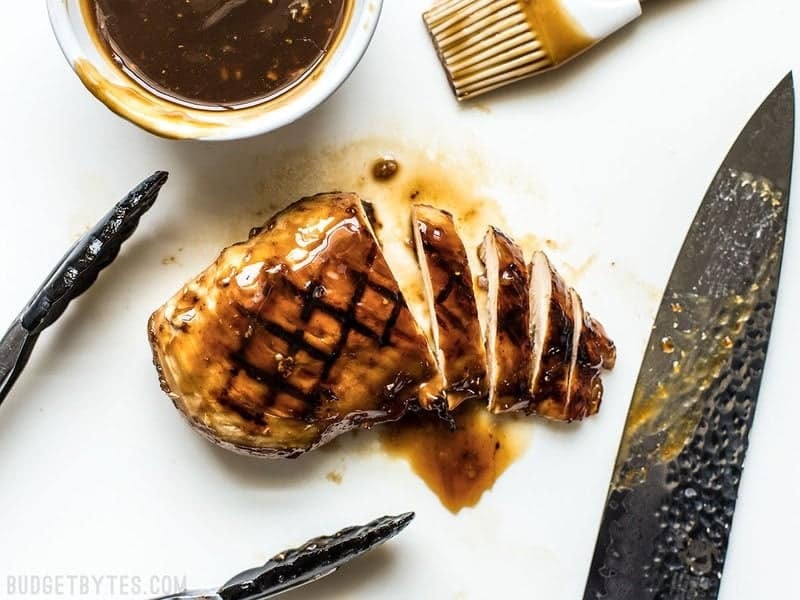 If you would like to both marinate meat and have a teriyaki sauce to add after cooking, it is best to make two batches (one to use as a marinade and one for the sauce) rather than turning the used marinade into the sauce. 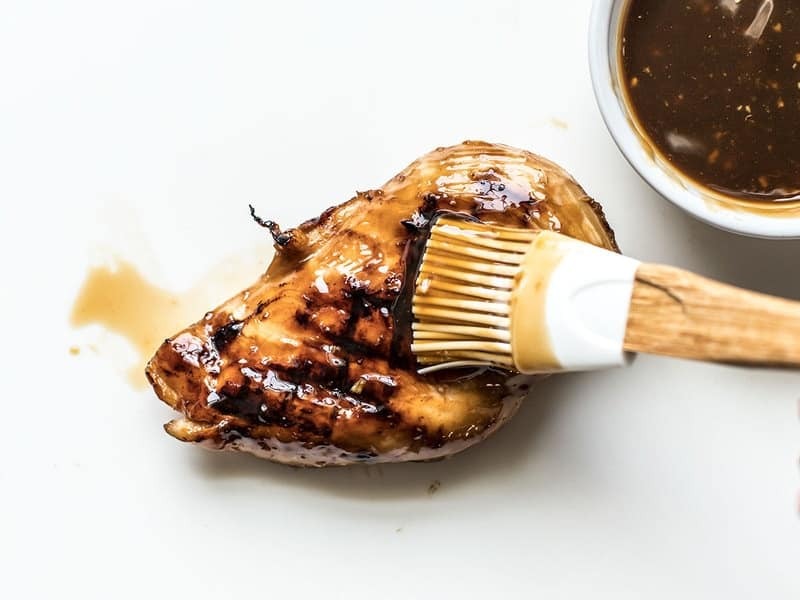 Reusing the marinade can cause cross contamination issues if it is not boiled long or hard enough, so it’s best to just keep the two separate. maybe a stupid question, but – when you say “transfer everything over” to a crock pot – the means slow cook the chicken in the marinade sauce, right? Correct. :) And that’s not a stupid question. I should clarify it. Thanks for pointing that out! Oh my, this was good! I usually buy bottled stir fry sauces but after cutting up my “clean out the frig” veggies I realized I had no sauces. Checked your blog and had all the staples to make the sauce, and used your suggestion to grate my frozen ginger. My chicken stir fry turned out great! Many thanks! Is it possible to make this and then store it in the fridge for whenever I need it, or is it an instant use sauce? You could probably store it in the fridge for about 4-5 days, but I wouldn’t keep it as long as store bought teriyaki because it doesn’t have any sort of preservative. i think this is going to change the way i make chinese food from now on. i’ve always just started pouring sauces and spices in on vegetables and meat, until i think it is about right. i think making the sauce separately will allow me to control the doneness of the vegetables much better. also, i’ve never seen you use chinese 5 spice powder. i guess you would grind each spice from fresh, if you wanted it there. This is a great recipe! I made it last night and it brought a block of tofu and some random vegetables that wanted using into a showstopper. I look forward to more of your sauce recipes. They really are game changers! Thank you, Beth! Served this just last night after I caught it on your IG feed a few days ago. WINNER WINNER CHICKEN STIR FRY DINNER!! My husband immediately said, let’s make a big batch of this and freeze it in cubes so we always have it on hand. 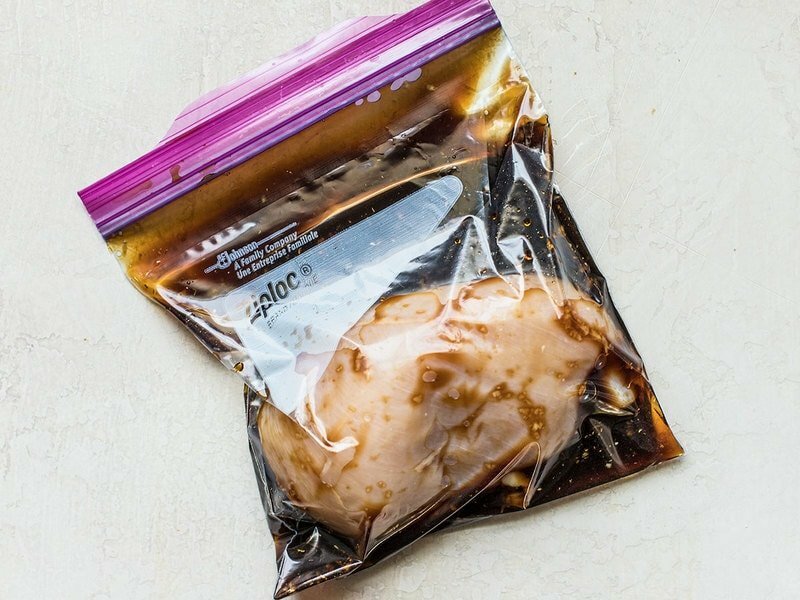 So, would this freeze better as the marinade recipe, or sauce recipe (or does it matter)? I made the marinade and used it to cook chicken thighs. I really like how easy this is to make. There’s something wrong with the search function on your website using chrome. When I go to search i type the query and then it ‘closes’ the search field before I hit enter. Just thought you’d like to know.